Feed Caddy Managers recently attended a poultry farm demo, arranged by Sales Manager Roger Harmelink. 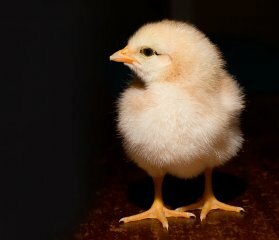 Roger has 4 units working on Poultry Farms in the Live Oak Florida Territory. These growers are very pleased with the Feed Caddy, and the overall time it takes to place feed for new chicks. 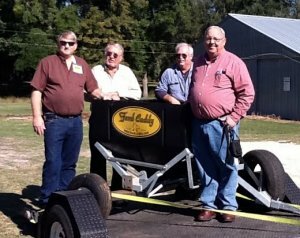 Feed Caddy Managers (Right to left) Lee Ward, Roger Harmelink, Harvey Payne, Feed Caddy Sales Manager Ken Thompson. 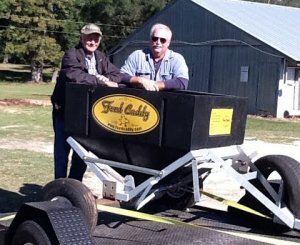 Pilgram Grower (left) and the Feed Caddy Southeast Manager Roger Harmelink (right) after an on-farm demo. Call Ken Thompson, Accounts Manager at 904 334 3654.